The Faculty of Nursing and Health Sciences along with the Alumni Office held a reunion for all the faculty’s alumni on Tuesday, 8 May 2018 entitled “Open Day for Faculty of Nursing Alumni 1980-2018”. 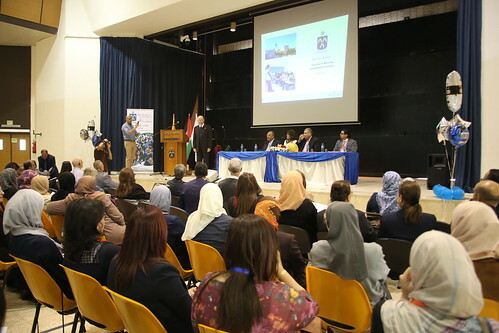 The Vice Chancellor of Bethlehem University, Brother Peter Bray, the Dean of the Faculty of Nursing, Mariam Awad, the Palestinian Ambassador to Pakistan, Walid Abu Ali, the sponsor of the event Abdul Raoof Bayaa, in addition to 250 alumni of the faculty attended the event. In his opening speech, Brother Peter Bray welcomed the graduates back on campus and emphasized that Bethlehem University cares about the students, employees and graduates who have a vital role in serving the community. He presented the university’s plan to expand the Faculty of Nursing and showed the new building of the John Patrick Cardinal Foley Hall which will house the faculty in addition to a Clinical Simulation Center. The Dean of the Faculty, Mariam Awad, said this was an opportunity for the graduates to come back on campus and see the development of the university in general and especially the faculty. She also updated the alumni with the achievements of the faculty including new programs, activities, and alumni reunions. The Lecturer in the Faculty of Nursing, Naji Abu Ali, said that this day was organized by senior students to develop their leadership and administrative skills. He also praised the Faculty for graduating students who proved their excellence in the field. The Alumni Relations Officer, Haneen Musleh, explained the mission and activities of the Alumni Office at Bethlehem University. She emphasized the importance of reconnecting and preserving ties with graduates. Walid Abu Ali, graduated with the first cohort from the Faculty of Nursing in 1980, shared his life experience with the attendees from graduation until becoming an ambassador. On behalf of the senior students, Christin Al-Yateem emphasized in her speech on the importance of teamwork. She also said that a successful nurse should have administrative skills. The Alumni Office at Bethlehem University is proud of all the efforts that the Faculty of Nursing does in raising the standard of education and doing their utmost to best serve students and graduates.